Small scale wind energy has significa nt potential in urban, suburban and industrial areas, but numerous challenges currently stand in the way to wide- scale uptake of this decentralised energy resource. The SWIP project has explored current technological, economic and social barriers to their uptake, and has recently outlined how to overcome them to European policy-makers. 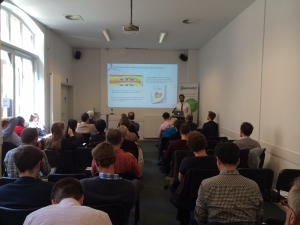 Over 40 participants from the European institutions, regional offices, city representations, research centres and consultancies attended the event, ‘Opportunities for small wind turbines in urban areas,’ on 11 May in Brussels, to find out about the SWIP project’s recommendations. The event, moderated and hosted by Greenovate! Europe, presented the key results from the SWIP project, focusing on the economic, societal and political requirements for boosting uptake of small wind turbines. The stage was set by Ignacio Cruz, Operating Agent for IEA Wind’s Task 27 on Small Wind Turbines, who established the main barriers in the sector, and the developments that will be needed to overcome them. Following this, project co-ordinator, Leo Subias, presented the main achievements of the SWIP project from a technological perspective, including improved wind resource assessment software, a new generator with improved efficiency compared to commercial generators, and new blades for greater efficiency and reduced noise emissions. Guidelines for integrating small wind turbines into urban areas were presented by Brian O’Brien from Solearth Architecture, including a decision making tool for those interested in small wind turbines. Simon Hunkin from Greenovate! Europe then presented the results of a survey on social acceptance, making recommendations for policy makers and businesses on how to set the right framework for end users. Regulatory and certification barriers were discussed by Bart in ‘t Groen, from DNV GL, outlining that small wind turbines are rarely taken account of in current support frameworks and that costly certification processes are a major problem for turbine manufacturers. The presentations were concluded by Gosse Hiemstra of Van der Meer en van Tilburg, who presented the business case for small turbines and made recommendations for new business models and the use of hybrid systems. All presentations from the event are accessible below.